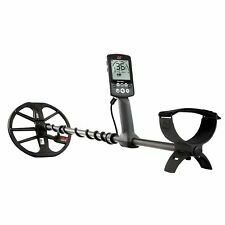 Minelab Equinox 800 Metal Detector - Grey. Condition new. Under warranty, purchased from leisure- promotions. unwanted gift. They built these detectors with the best of everything available for the Military & made them very simple to operate. These MineLab Detectors with the F1A4 XLT Upgrades make these a high performing detector and consist of the following. If you're looking for super sensitive gold performance at a great price, then this is the detector you've been waiting for! Detector Length 1382mm–944mm (54.4"–37.2"). Detector Weight (with 10" x 6" coil) 1.33kg (2.94lbs) (excluding battery). I sent it to The Detector Center back east and had them go thru it. They are a authorized Minelab Repair center. They replaced the O rings and put on new knobs. I just got it back on 4/7/2019. Excalibur 2. 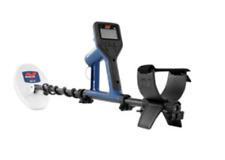 The GPX 5000 sets a high benchmark in gold detecting technology. The serial number was verified by Minelab USA on 03/12/2019 and the item was produced in June of 2012. With two find modes and Minelab's. Easy-Trak technology you can start searching and uncovering finds without the need for complicated settings. Or you can choose the type of object you want to target utilising up to four pre-set modes. Affordable and easy to use, it is the ideal first detector to ignite an interest in the hobby. With two find modes and Minelab's. Easy-Trak technology you can start searching and uncovering finds without the need for complicated settings. If you're looking for super sensitive gold performance at a great price, then this is the detector you've been waiting for! "I found my first nugget within an hour; funnily enough it was in a detector scrape from previous excursions. With three find modes and Minelab's. Easy-Trak technology you can start searching and uncovering finds without the need for complicated settings. WithWireless Audio via Bluetooth® you won't need to be tethered to your detector. Manufacturer: Minelab Electronics Pty, Ltd. Two Pinpoint Modes: Auto and Sizing; The new Sizing feature gives valuable information on target characteristics including shape and size. Weniger Zeitaufwand.Gerade Unterwasser ist Zeit kostbar. In erster Linie ist der Excalibur ein "Unterwasserdetektor", der aber genauso an. Deshalb durchdringen die Excalibur - Modelle den Boden viel besser alsvergleichbare. "The Minelab EQUINOX is truly in a league of its own. Equally adaptable for all target types and ground conditions, just set your detecting location and go! (3m / 10-feet). "EQUINOX GOLD BABY! The field was very contaminated and busy with lead, scrap, iron, etc. Manufacturer: Minelab Electronics Pty, Ltd. We may no longer be able to change or cancel your order. Metal detector Bags White’s Minelab Big lot!!! The design of the Minelab Excalibur II allows you to use it as effectively in or out of the water - this amphibious machine can move seamlessly from land, beach and wet sand conditions to underwater depths of up to 200ft (66m). Pluie, saleté & housses kit s’adapte à la suite des modèles de détecteurs de métaux :Garrett Pro pointeur, pointeur Garrett Pro à, trouver Minelab Pro 25. Ils sont fabriqués à partir tissu de haute qualité avec la technologie la plus avancée disponible. "The Minelab EQUINOX is truly in a league of its own. Equally adaptable for all target types and ground conditions, just set your detecting location and go! "EQUINOX GOLD BABY! The field was very contaminated and busy with lead, scrap, iron, etc. Minelabe Xterra 70 Speaker And Housing With Plugins. Condition is Used. Speaker and rear part of housing is in perfect condition. Mounting post is flawless. Headphone jack cover(rubber) included.speaker works good and plugins work also. Basically it’s the rear housing with speaker and plugs only.it would make a nice repair for the cracked post you might have. GRATIS 42cm große Tiefensuchspule - wasserdicht. DD Doppel D Smart Sensor Suchspule 28 cm Wasserdicht. Rechnung ist vorhanden und wird mitgeschickt. Esatz Batterie Modul. 42cm deep depth search coil - waterproof. 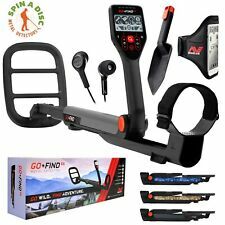 A lightweight, easy to use, coin and treasure-hunting detector designed for the beginner looking for a more serious start or for the hobbyist who does not want or need the top of the range machine. The X-TERRA 305 is suitable for the whole family and there is even a short shaft available for keen youngsters. MINELAB PRO FIND 35 WATERPROOF PINPOINTER. A PRO-FIND Series Pinpointer is an essential part of your detecting tool kit. The PRO-FIND’s bright yellow handgrip is clearly visible for easy location, so you won’t leave it behind after you dig. MINELAB PRO FIND 15 PINPOINTER. A PRO-FIND Series Pinpointer is an essential part of your detecting tool kit. Great performance, excellent value! PRO-FIND 15 pinpointer. DIF technology makes PRO-FIND a clear winner in the field!". Und der Minelab X- TERRA 305 wird diesem Ruf erneut gerecht! Sein ultraleichtes Gewicht, sein 3-teiliges Suchgestänge und seine hervorragende Balance ermöglichen Ihnen ein komfortables und ermüdungsfreies Arbeiten. THESE BEAUTIFUL HEAVY MADE MINELAB. DELUXE HEAVY DUTY ~ DETECTOR CARRYING BAG. ZIPPER POCKET ~ CANVAS. BLUE & RED. THROUGH THE. AND WILL BE. Minelab GPZ 7000 SUPER DETEKTOR! Niemals zuvor entwickelte Minelab einen solchen multifunktionellen, leistungsstarken, leichtbedienbaren und effizienten, ultimativen Gold-, und Tiefendetektor wie diesen. Originalprodukt Minelab GPX 4500 Gold- und Tiefendetektor Inklusive 2 Suchspulen. Originalprodukt Minelab GPX 4500 Detektor. Der GPX 4500 ist eine Minelab Entwicklung im Bereich "Gold- und Tiefendetektoren!". It is 2 years old but used about 5 hours totally. 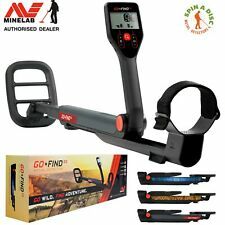 Minelab GO Find 40 Metal Detector 3231-0002 - GorillaSpoke, Free P&P IRE & UK! The multi-IQ frequency range is shown for both the EQUINOX 600 and 800. This chart is for guidance only. Equally adaptable to all types of targets and ground conditions. You just need to select a search location and get to work. Minelab gelang ein weiterer bahnbrechender Schritt in Sachen Detektortechnologie. Wenn sie den E-TRAC benutzen, dann werden sie mit Sicherheit einer der erfolgreichen Detektoristen, welche ihre Leidenschaft und ihre Liebe zu diesem Outdoor-Hobby mit derEntdeckung von wertvollen Münzen, Artefakten, Juwelen und Gold verbinden können. Er eignet sich ideal für die Suche nach gut verborgenen Nuggets unter 1 Gramm an Land oder im Wasser. Goldplättchen und andere Goldnuggets schnell und einfach. Der Minelab SDC 2300 Golddetektor. Konstruktion gemäß Militärstandards. Minelab's VLFEX technology uses state of the art digital and mixed-signal components to enhance standard single frequency technology by replacing most of the analogue circuitry with digital signal processing. Minelab X-TERRA 6" Double-D 18.75kHz Coil for 505, 705, 705 Gold Prospecting etc. Minelab X-Terra 505. Sein ultraleichtes Gewicht, sein 3-teiliges Suchgestänge und seine hervorragende Balance ermöglichen Ihnen ein komfortables und ermüdungsfreies Arbeiten. 3 vorprogrammierte Suchmuster (inkl. ).